Congratulations to "Lynda C", the winner in Maggie's giveaway. Thank you to all who participated. Hot Water is the book that almost wasn’t. Book 1 in the Mossy Bog trilogy, Muddy Waters, was supposed to be a standalone romantic suspense. Book 2 didn’t exist. But fans demanded more from my small town of Mossy Bog on the Georgia coast. What’s not to love about a place steeped in nautical history, framed by centuries old live oaks fringed with grey beards of Spanish moss? Laurie Ann is a cop. My initial reaction to writing her book was pure panic. I don’t know much about cops. But I have interviewed a few in my real life job as a reporter. I’ve been on a police ride-along. I’ve attended Writer’s Police Academy. Okay, I might be able to write a credible cop. But what would the story be about? For that, I searched the newspaper archives of the real seaside town that serves as a model for Mossy Bog. A restaurant fire in a historic structure caught my eye. Lots of shenanigans and finger-pointing. Just my kind of story fodder. So I had the heroine. I had the story idea. All I needed now was a worthy hero. A friend of mine writes great wounded heroes. I started with that premise. My hero would have a traumatic incident in his past. Since Laurie Ann was a cop, my hero needed to have an equal level of toughness and courage. With that thought, Wyatt became a firefighter turned arson investigator. His firefighter pal was the serial arsonist’s first victim. While hunting the arsonist to exact justice for his fallen friend, Wyatt comes to Mossy Bog to investigate a man found dead in a fire. He reached for her hand and caught it. “You’re something, Dinterman.” He lifted her hand, brushing her knuckles with his lips. Wyatt was very close now, close enough so that she could feel his breath feathering her neck. Heat steamed sauna thick around them. His blended scent reminded her of Christmas trees growing at the seashore. She knew exactly the gift she wanted from him. She thought about waiting to see his next move and rejected the idea. Instead, she closed the inches between them and kissed him lightly on the lips. A quick taste and a strategic retreat. Or at least, that was her plan. Instead, he snugged his hands around her waist and held her in place as he set about kissing her socks off. She tried to be objective, tried to compare this to other kisses, but the only thing running through her head was wow, wow, wow. The man knew a lot about fires because every part of her was one degree away from flashpoint. What’s your favorite kind of hero? Do you like strong males, compassionate males, or a blend? 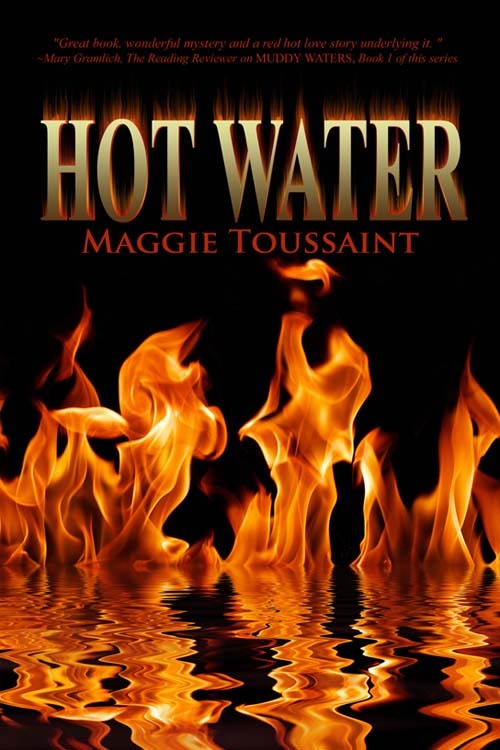 Leave a comment to be entered in the giveaway of a copy of Hot Water, your choice of format. Giveaway ends 11:59pm EST July 16th. Please supply your email in the post. You may use spaces or full text for security. (ex. jsmith at gmail dot com) If you do not wish to supply your email, or have trouble posting, please email maureen@justromanticsuspense.com with a subject title of JRS GIVEAWAY to be entered in the current giveaway. My hero would be like Roark from the "In Death" series by J.D. Robb. He is strong and compassionate. He is also protective and supportive of Eve Dallas. He also knows when to give her personal space. He is quite an alpha. Good morning, Kai! It's so nice to make your acquaintance here at Just Romantic Suspense. Roarke from JD Robb's RS series is an alpha male with a huge romantic streak. I love how he takes such a personal interest in Eve's wardrobe and he allows her to be herself. Hi Maggie, I love reading about the inspiration and research that led to your stories. Great excerpt and wonderful book with the right amount of suspense and sensual tension. I love your novel's title, "Hot Water." We can all relate to that. It makes me think of romance, mystery, intrigue and the trouble characters can get themselves into. It's the alter ego of cold blood. You have discovered how to write alpha men and yes, I like strong men. The kind that show their strength and portray a good deal of integrity with added inner warmth. For a real high think James Bond. He has all the components needed, but his author teases us and won't let him settle on any one woman. He seems to get them in the end and moves on in the next adventure. I've always enjoyed the James Bond series and for years thought I'd grow up and marry Sean Connery, who was one of my favorite Bonds. Those eyes, so melt-worthy. Anyway, strong heroes and men of action are great, but I also adore a hero with that softer side. Makes me fall in love over and over again. I like my heroes to be lacking the requisite skills to do what they have to get done to save the day, for whatever reason. Lack of tools, no experience, injury, mental obstacles--you name it. I don't think a mountain-climber hero rescuing a trapped child is nearly as heroic as someone who's afraid of heights and might never have climbed a mountain before. I love pushing my heroes as far as I can, both physically and emotionally. Your heroes are a good blend of strong, caring, and flawed, Terry, which is a dynamic compilation, and keeps me turning the pages. OK, I'm with Kai and Terry here: to-die-for Roarke and don't/can't-do-that hero. A blend of compassion and alpha male. Thanks for saying you love my writer voice. I'll be smiling all day. Roarke appeals to me because of his rough edges and how fierce he is to protect what is his. He's also got the smarts and compassion to match wits with Eve. That's not as easy as people think - to get that balance of hero and heroine right. I'm so glad your comment made it through this time. Yay for persistence! Some people know that Mossy Bog is a fictionalized rendition of the coastal town I reside in, but it isn't a secret. We're a mostly poor town on the coast, with tourist meccas north of us (Savannah) and south (The Golden Isles of Georgia). We have the same environmental resources, and our town was laid out by the same general who laid out Savannah, but somehow progress has passed us by. A goal of mine with this series is to draw positive attention to the amenities of a low-key coastal town, hoping to attract visits and residents from like-minded individuals. Not sure if that's happening, but I can dream. I loved Hot Water. Great action scenes and heartwarming romance. I can see why readers of your first book wanted more stories set in this quaint small town. Mossy bog is a character in its own right. even the name is evocative. Thanks for the kind words about the action scenes and heartwarming romance. Those are my goals as I sit down at the keyboard to compose. I'm so happy to learn that my settings are getting such fine attention. Back in the Dark Ages when I began writing, settings were one of my weaknesses. I've worked very hard to grow my craft and create settings that resonate with readers. My favorite kind of hero is Wyatt. What's not to love there? I adored this story, and Laurie Ann Dinterman...of course, she's from Georgia?--was a wonderful character. Tough as nails, all business, but has a soft center. I liked reading your research for this novel. That in itself is a good lesson. Thanks for stopping by. I'm happy that the story worked for you as a reader. That's a goal and a dream every time I send a book out there. I already know it works for me, but to hear those words from readers, well, it does a body good. Thanks for the visit, and thanks for loving Wyatt. I'm still in love with Tom Selleck from Magnum, PI. Ahh, dates me doesn't it. I was a Magnum gal myself. Something about that man, um-um. Can't say anymore without blushing! So happy to see you here. Thanks for the comment. I like heroes who are just real people, non heroic, trying to do the right thing despite the odds. Your books are always so charming. I have to pick this one up, too! Your comment struck a true note on my heartstrings. Real people doing the right thing - that's something authors love to hear. The fact that my characters seem like living, breathing people, gosh. Thanks. Laurie Ann is a strong woman, and you created a perfect mate for her in Wyatt. Loved Hot Water. Good job, Maggie. I want to visit your "fictional" town. I like versatility in a reader! And HEAs are what brought me to writing. While justice isn't always served in real life, you can count on a HEA in one of my books. If you'd like to be considered for the drawing, don't forget to add your email. I tried to reply under your comment, Polly, but I can't seem to get up there from here. Anyway, thanks for your wonderful thoughts about Hot Water, and you are welcome in Mossy Bog anytime you like! Thank you, Diana. What a pleasure to have you visit me at Just Romantic Suspense. I'm honored. Maggie, I admire you so much for being able to write mysteries. I don't think there is any way on God's green earth I could do that and pull it off. I bought Hot Water, but haven't had a chance to read it yet--still have it to look forward to, though! Congratulations on all your many successes, and I know Hot Water will be another one! Thank you for stopping by. I'll spill the beans, folks. Cheryl's wounded heroes were the inspiration behind my Wyatt in Hot Water. Whenever I get through a Cheryl Pierson romance, I am sad to see those friends go. I look forward to reading Hot Water. My favourite hero is someone who is strong when he needs to be but caring and sympathetic as well. In short, heroes who don't think of themselves as heroes, but will do what's right! You and I have similar likes in heroes. And because that's the case, I predict you will fall in love with Wyatt. Be sure and post your email addy here to be entered in the giveaway! We moved to California, so I'll miss seeing you at WRW meetings. And congratulations on your continued success. I'm so proud of you and your accomplishments. I didn't know of your move, but I hope it brings you joy and happiness. And you have such a classic sense of style and timing. Cary Grant and Sean Connery. Um. Yes, I shall go to sleep with a smile tonight! You are a reader of few words! Loyalty is an important trait in a hero, and Wyatt has that in spades. His dedication to his late partner's murder has driven him to find justice. Thanks for stopping by and entering the giveaway! I like my men to be hard. But they need that compassion too , just not wearing it on their sleeve. Thank you for the opportunity to win.!!! Thanks for sharing your thoughts on heroes. Keeping my fingers crossed for you. Be sure and leave your email addy here so we can contact you if you win. Great to hear how it can together in your mind. I like all kinds of heroes. I enjoyed reading about the type of heroes you favor - all of them! Thanks for commenting and entering the giveaway. Every book does require a journey and I loved reading about this one. My type of hero is definitely the Alpha male, strong, silent, and a little rough around the edges. But, his heart must have a marshmallow center for the one woman he'll love forever. I loved reading your description of Lynda's perfect hero. Like you, too perfect doesn't work for me. A few rough edges and that wonderful tender side for his someone special. Best of luck in the drawing. I know this book is good because all of your previous ones have been. Congrats! Why thanks for your comment, Jacquie. That's high praise coming from you. Have a blessed day! I love a blend. I also love how this storyline was put together. I'm so glad there is a market for blends. Lord knows I've tried to write straight mysteries and straight romance for years, but it always comes out a blend of both. I wish you luck in the giveaway drawing! I like a hero to be strong, compassionate, and loyal. I love how your name is spelled. It really catches the eye! Thanks for sharing what your preference is for heroes. I'm intrigued that the word "loyal" has come up so often in the comments for this post. Are real men becoming less loyal? Is loyalty now a fantasy women only expect between the pages of a novel. Gosh, I hope the world hasn't come to that. I write romance novels because I believe, with all my heart, in Happily Ever After. I hope everyone of you out there finds your own HEA. Thanks for having me here at Just Romantic Suspense. I'll eagerly await the results of the drawing to find out who my winner is.